What dish brings you home? No matter where you are in the world or in your life, if you or someone else is making this dish, it brings you back to being a kid. Maybe there’s more than one. That’s the case for me. I grew up with a very strong Italian culture influencing many parts of my life but with a Polish grandfather, we also had some very simple meat and potato dinners. A favorite of my grandparents’ was a traditional beef roast. My Noni would make these on particularly chilly nights or on weekends for a nice family dinner. When you make a big chunk of meat like this and fill the pot with herbs and veggies, you can smell it around the entire neighborhood. It smells like home. It smells like comfort...like love and laughter. It was only fitting that the first fall recipe I shared for the season was inspired by that classic home cooking that makes me feel all gooey inside. The difference - I made a few upgrades. For starters, this large chunk of meat is bathing in two bottles of beer. It's not usually my drink of choice but I felt that it needed a little extra heartiness only beer could give. I just have one rule for you...low and slow. No one likes a dry roast. The trick to getting it nice and juicy is to sear each side in a pan before sending it in the oven to cook. The sear will give you tons of flavor and keep all the juices inside while also providing a great crust. 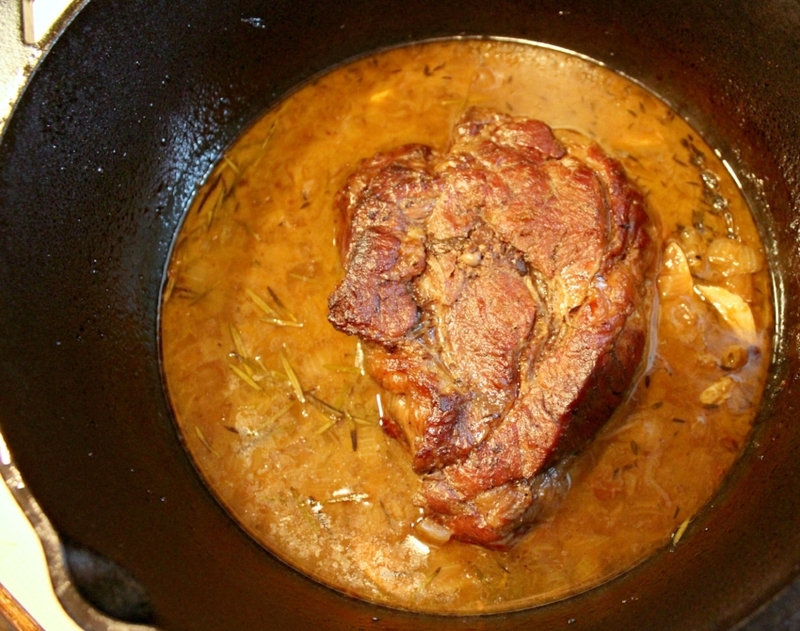 The low and slow braising will ensure a tender meat and a fantastic smelling home. You can roast the veggies with the beef but I prefer roasting them separate. Roasted vegetables have such a beautiful flavor, cooking them with the meat risks the chance of making them mushy. I used my cast-iron dutch oven for this recipe. It makes it an easy one-pot number. Start with a little olive oil at the bottom. Season the entire roast with salt and pepper and then sear every single side. You want a nice crust around the whole thing. 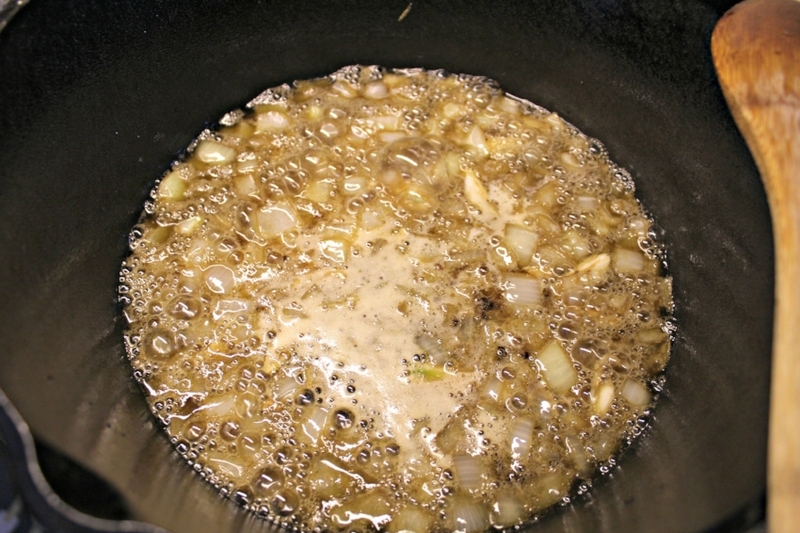 Remove it to a plate, add a little more oil if you need to and then the garlic and onions. No crazy chopping is needed here. Smash the garlic and roughly chop the onion. Let it sweat a bit add the beer and then your secret ingredient, orange zest. The orange zest pairs perfect with the Octoberfest beer and it adds an element of “what is that” to the dish. Do not leave it out! Finish it up with some herbs, add the roast back and pop it in the oven. The veggies are even simpler. Keep scrolling for the full recipe and tell me in the comments below which dishes instantly bring you home! 1 - Preheat the oven to 325 degrees. In a Dutch Oven, heat the olive oil over high heat. Season the roast generously with salt and pepper. Sear on each side 3-5 minutes to develop a deep crust. Remove the meat to a dish. 2 - Reduce the heat slightly to medium-high. Add the onion and garlic. Stir frequently and scrape the bottom with a wooden spoon to release any drippings from the bottom of the pot, about 5-6 minutes. 3 - Add the beer slowly, continuing to scrape the bottom to make sure all of the browned bits get loose. Add in your orange zest and let simmer a minute or two to let some of the alcohol burn off. 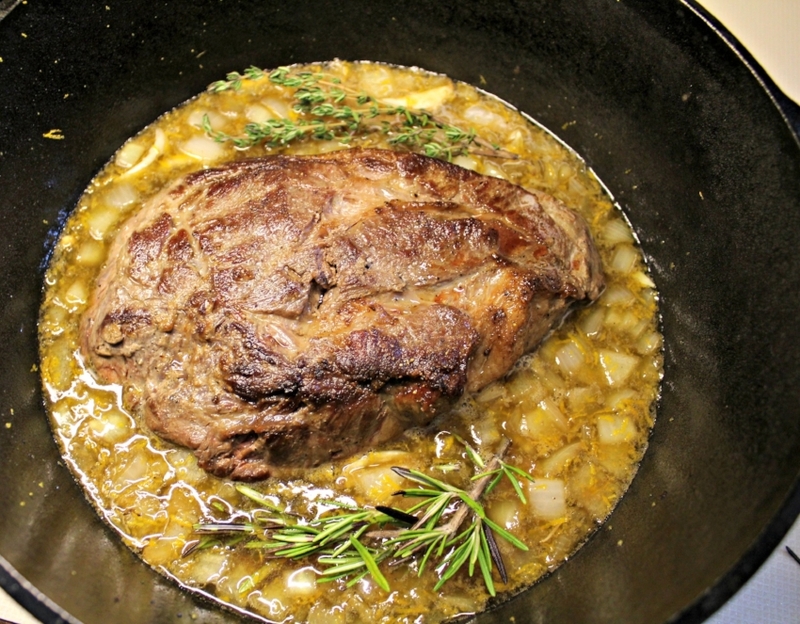 Return the roast to the pot, add the rosemary and thyme sprigs. Cover and move to the oven. Let cook 2-3 hours or until the meat pulls apart easy. 4 - In the last 40 minutes or so of cooking time for the beef, mix together the veggies, olive oil, salt and pepper on a baking sheet. Place in the oven on the second rack and roast 40-50 minutes until the vegetables are tender. Serve the beef with the veggies on the side.